The writers are more confident than ever that fans of the show will follow them just about anywhere, and they really cut loose this time around. For a show that wasn’t afraid to be silly from the very first episode, there’s some stuff here that’s truly insane. Whether Finn is trapped in a dream by the mysterious King Worm, or prisoner of Ricardio (an anthropomorphised heart voiced by George Takei), or Jake is put on trial by the King of Mars, Abraham Lincoln, the show certainly hasn’t lost its ability to shock, surprise and bewilder. For a show that initially featured primarily male characters going on adventures to rescue/impress a whole host of princesses, it’s made some admirable steps to redress the balance. I’ve only just twigged that, despite the initial setup, this show plays around with gender roles more than most kids shows, to the extent where it frequently blurs all things binary. Whether it be the increasing importance of vampire Marceline and her purely platonic relationship with Finn, the fact that scientist extraordinaire Bubblegum Princess no longer always wears dresses or Finn has no qualms about kissing a guy to break a curse, the show has become more and more progressive. The writers also dabble in foreshadowing, producing multi-episode storylines and show a willingness to drop narrative bombshells that they won’t address until many episodes down the line. This is good, but also makes watching a complete season in order sometimes baffling, and for the first time I understand why Cartoon Network also releases themed collections in addition to the complete season sets. 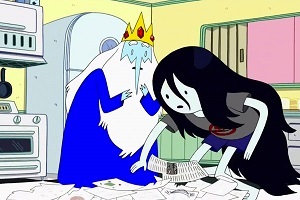 There are only one and a half dud episodes out of the 26 to be found here, truth be told, and if you’ve enjoyed Adventure Time up until this point, you’re unlikely to disappointed. The Blu-ray image looks fantastic (I’ve been making do with DVD releases up until this point) and there are a bunch of commentaries and a short featurette included. I was occasionally overwhelmed by the amount of detail included in these oh so brief episodes, though to be honest I didn’t even know about the snail hidden in every episode until now, so perhaps I’m not paying enough attention. When the next season comes out, there are some significant episodes here I’ll definitely need to revisit. Adventure Time - The Complete Fourth Season is available now on Blu-ray and DVD from Madman. Writer: Cole Sanchez, Rebecca Sugar, Tom Herpich, Skyler Page , et al.